From new technologies that can enhance the way you drive, to the latest releases from your favourite van manufacturers, you'll find a wealth of information here, including how we get involved with the community. We work with local companies and organisations, so you can also find out about recent or upcoming events, such as fundraising or sponsorships that may be of interest. We understand the importance of keeping up-to-date with industry news, as well as keeping our customers informed. That's why we post regular news stories to benefit you and to let you know about the latest developments. On top of this, our news pages also offer advice and general guidance on how to keep your van secure. We also discuss the differences between leasing and purchasing, and changes to industry standards such as Euro 6 and what this means for drivers. Read our latest news stories on this page. If you have any news stories that you think may be of interest, we'd love to hear from you. Should I Buy An Automatic Van? How Do I Keep My Van Secure? 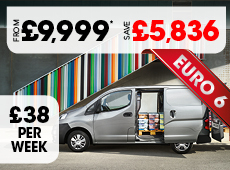 What Does EURO 6 Mean For Van Drivers? What Is Mirror Screen® Technology? What Van Should I Buy For My Business? Should You Buy or Lease a New Van? Should You Sign Write Your Van?